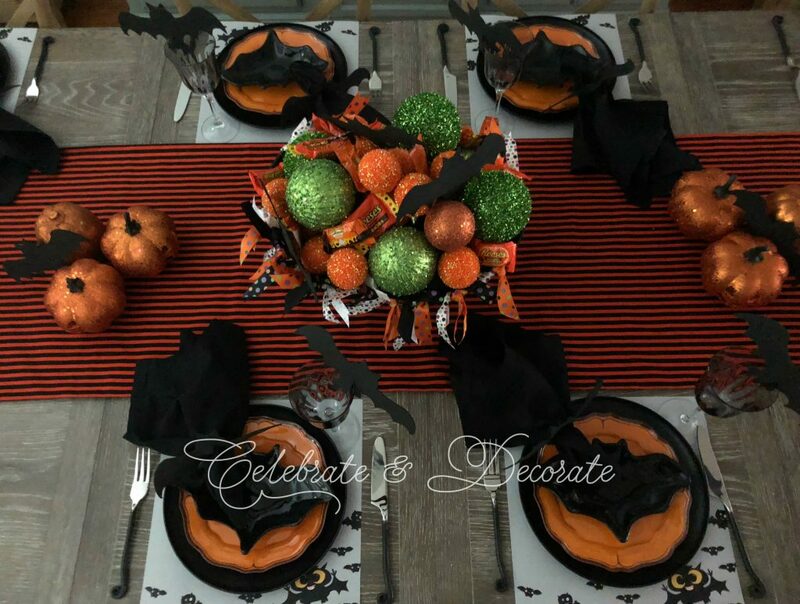 Halloween Tablescape and a Tour of Tables! 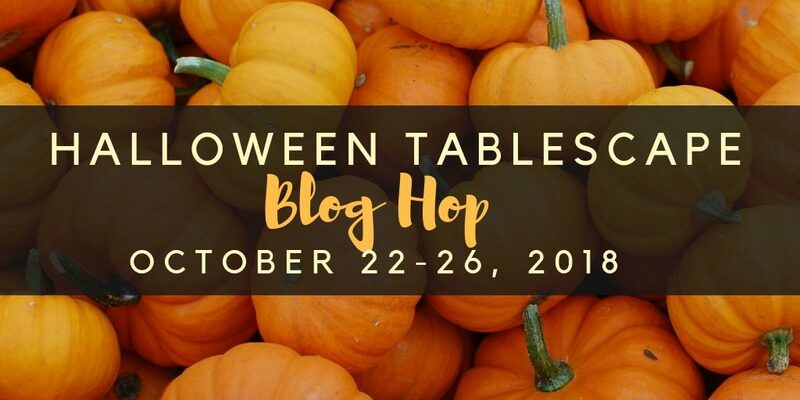 I am so happy to be hosting another tablescape blog hop this week featuring the talents of almost 20 bloggers. 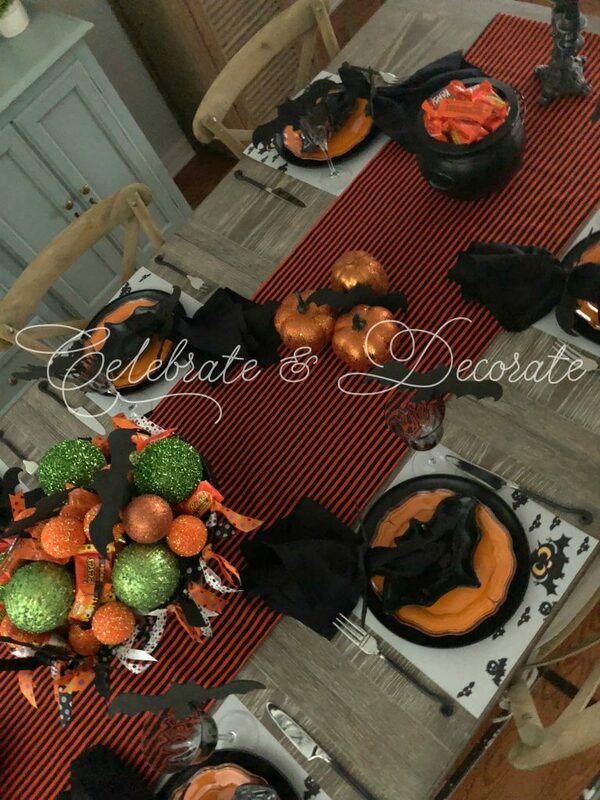 This coming weekend is the perfect time to invite friends for a casual meal and set a Halloween themed table! I set a fairly simple table for Halloween this year, something anyone could re-create for themselves. Simple orange and black striped fabric was fashioned into a runner for my table. 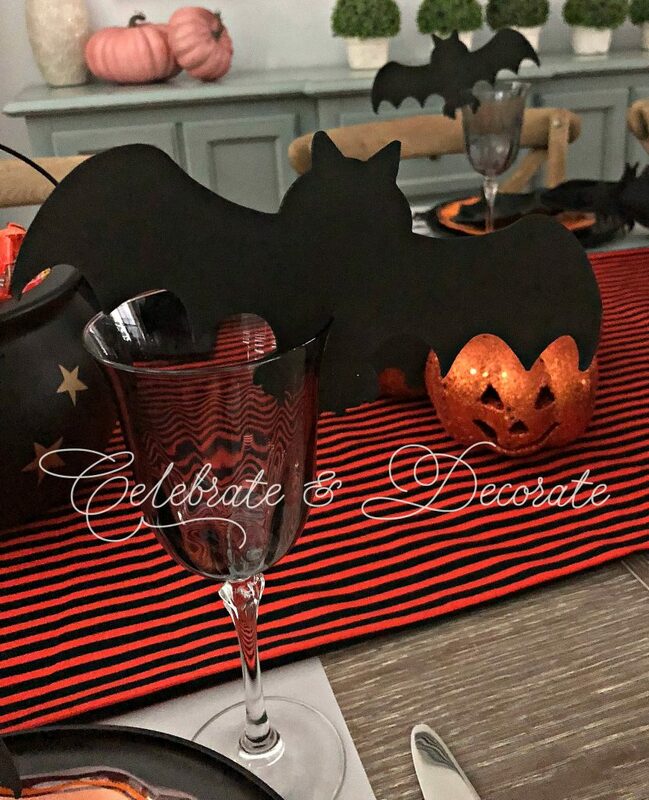 These adorable scrapbook paper sheets with the silly bats caught my eye and I decided would make perfect placemats for my “batty” tablescape. The black bat appetizers came from Home Goods. I kept my centerpiece simple with a pretty black basket trimmed with Halloween ribbons and filled with green and orange balls and foam bats. I added a couple of black plastic cauldrons filled with Halloween candies. Foam bats were cut with a slit and placed on the edges of my gray goblets. Additional foam bats were used as napkin rings with just a pair of cuts in the middle of them. 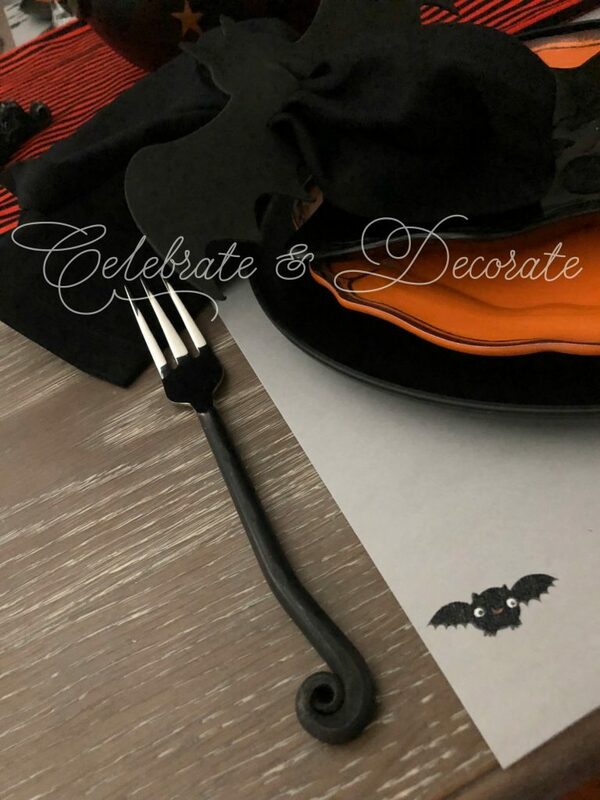 I have eyed this fun flatware for some time now at World Market and decided to take the plunge and add it to my flatware collection, these are so perfect for so many occasions, but they particularly lend themselves to Halloween, don’t you think? 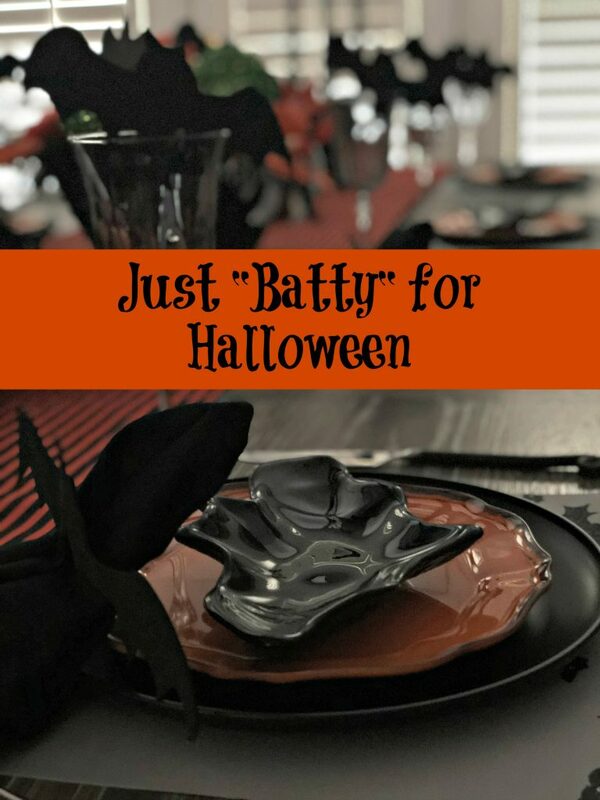 Take a few minutes and visit all of these blogs for a plethora of different interpretations of Halloween tablescapes! Looks so fun! Love the epicenter! Ditto what Mary said! Your happy, colorful kid-friendly tablescape brought a smile to my face. I’ll bet your granddaughters loved it! The clever use of disposable scrapbook paper as placemats and cutting slits in the foam bats were my favorite takeaway ideas. Adding the bats to glasses is a great way to transform any glass into a Halloween one. You could even use a white paint marker to add names to double-duty as place cards. Chloe, what a fun table that you have created with such cute details. The scrapbook sheets make wonderful placemats and also quite clever! 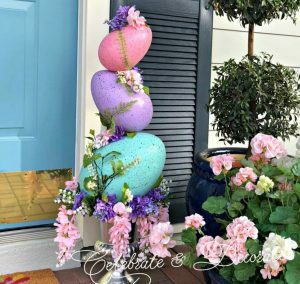 I have enjoyed following along on this blog hop! Ooh, that’s wickedly attractive, Chloe! Love your centerpiece and the way the table looks to be laid out in diagonals. It’s been a really busy week for me, but I’m looking forward to indulging my witchy self over inside all these great tables you’ve organized over the next couple of days. Looking forward to sharing in the next one. Cute table Chloe! Love the scrapbook sheet idea and the foam bats resting on the stemware! Looks like another great blog hop! Chloe, your batty table is fun and so playful. I love your festive centerpiece and the bat plates are awesome with all of your bat accents. The silly bat scrapbook paper as chargers is such a great idea and makes your bat plates come alive. What a whimsical and cheerful table. So cute Chloe!! I love your batty scene! The centerpiece of balls and ribbons is simple but so impactful! Your runner and placemats are brilliant plus thrifty! Wonderful fun! Thank you so much, I swear, the tables get better and better every hop! So cute, Chloe! Love the flatware & bat cutouts on the glasses! Perfectly fun & stylish! Orange & black is one my favorite Halloween color combinations. Thank you for inviting me again for one of your hops! Have a great weekend! How fun! Who knew bats could be so cute!! I love the scrapbook paper idea and all the cut outs for your stemware and your napkin rings. Your centerpiece is so cute – something different and colorful. Thanks so much for all your work putting these hops together, I appreciate all it takes to get us all organized and up to date. I hope you can relax a bit and enjoy your Halloween! Adorable, Chloe! I know your grands must just love this one! I love your fun placemats and I’m so envious of your new flatware! I might have to take the plunge on a set for myself. Happy Halloween to you! Very cute Halloween table Chloe. I love how you think! The bats make this table look so creepy. Loving the new black flatware. I can see why you bought it. Wonderful centerpiece with the balls and added ribbon. 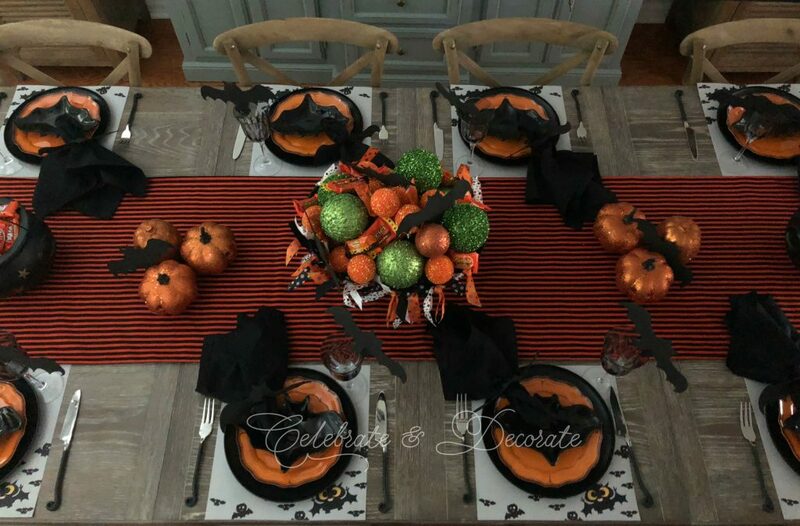 Truly a traditional Halloween table with orange and black. The overhead shot is awesome. 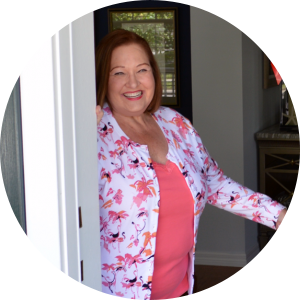 Such a pleasure to join you on this fun tablescape blog hop. Chloe, this tablescape was so cute and so much fun. 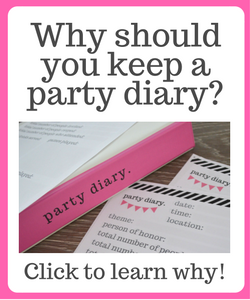 I love the idea to use scrapbook paper – never though of it! And I covet that flatware. I can imagine so many times that could be used and add some panache to any vignette. Thanks again for hosting this! I love all the bats and the centerpiece is gorgeous. Always fun to be a part of your blog hops my friend. Chloe your little bats are so fun! I immediately smiled when I saw the placemats, and I love that you used scapbook paper! I have been looking at all the pretty papers as alternatives to expensive placemats for tablescape hops. Now I see that they look great and I couldn’t even tell! Your cute jack-o-lanterns and bats just seem so fun for Trick-or-Treat and made me excited to see all the kids on Trick-or-Treat night! Thank you so much for hosting and inviting me to be a part of this hop. Have a Happy Halloween! Chloe, I love your batty tablescape! How smart of you to use scrapbook paper for placemats! I love the jack-o-lanterns and those bat plates! If you ever want to host a Batman themed party, you got it covered! 🙂 Thanks so much for inviting me to join the hop – all the tables are so pretty and this has been so much fun! Cute, cute, Chloe. I like your batty table! I bet your girls love this whimsical table! The styling lends itself to adults and children and you did an expert job. You have a knack at assembling a centerpiece and this one is so much fun. Thank you in gigantic bunches for bringing us together again. It’s no small feat to organize these hops and you are appreciated. Happy Halloween! 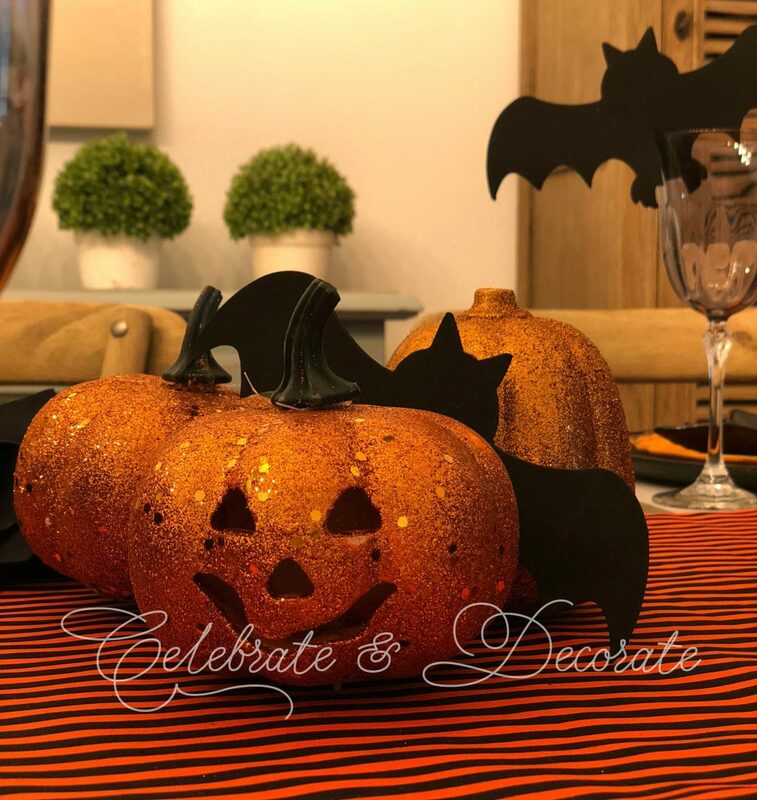 What an adorable tablescape you created for Halloween! I love the idea of using scrapbook paper for placemats. I need to remember that. Your new flatware is really interesting and will certainly be a conversation starter when gets see it. I can hardly believe that Halloween is almost here! Clever to make your own runner and cute placemats. Clever theme. Would you believe I had real bats roosting behind my mirror on my porch during the day one year? I was cleaning the mirror and just happened to see them. Chloe, I love your table! 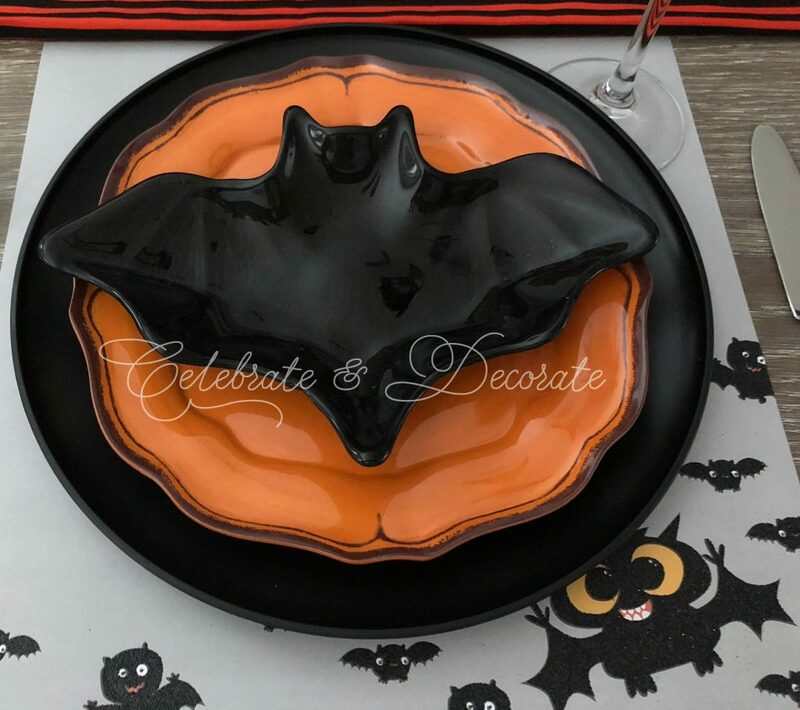 The bats are such a festive touch and I agree – that flatware is perfect for Halloween. Thank you for hosting such a fun Tablescape hop! Chloe, your table is spot-on! I love the silhouette cut outs on the rim of the glasses and your glittery centrepiece is fabulous. Your orange salad plates are stunning, and I really need to find myself that flatware! 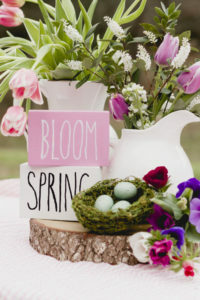 Can’t thank you enough for hosting our tablescape blog hops! They are always a favorite! What a fun table!Everything lends itself to the spirit of the occasion. About your flatware, I agree 100%. Everything about them screams Halloween. The first time I saw them, I thought that I had to buy them too. One of the Hubby’s favorite movies is “A Nightmare Before Christmas”. That’s exactly what this set of flatware reminds me of when I looked ad them The curling handles are reminiscent of the designs in the movie. Well done. Thank you so much Edmee!